The Baroque Churches of the Phillipines represent a fusion of European church design (baroque) and local construction techniques and decorations. Their specific characteristics include a separate bell-tower and strong buttresses to withstand the powers of earthquakes common in the region. San Agustin in Manila was the first Phillipine baroque church that I visited. It's located conveniently in Intramuros, Manila's small historic center, the only building to survive WWII there. From the outside this is a bulky church with a Latin American touch. On the inside it's more refined. It can be visited from the adjoining monastery complex, a quiet refuge from Manila's hustle and bustle. A more exemplary exponent of the so-called Earthquake Baroque I saw in Paoay, a village 1.5 hours by bus from Vigan (Northern Luzon). This church is also called San Agustin, the Agustinians being the first order to arrive in the Phillipines in 1565. 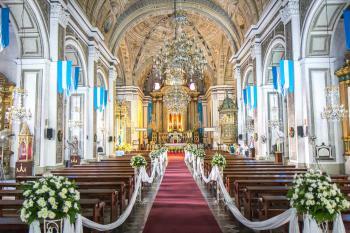 This San Agustin church has a spacious setting, so you can have a look at it from all sides. The large buttresses every few meters that keep the church standing look sturdy enough to withstand any earthquake. While I was looking around this pleasant site, an also visiting Filippino family told me that there even had been an earthquake here last night. "Oh, we have them here all the time...", they said (obviously without worrying). The San Agustin Church will undoubtedly survive a few more. Over five hundred churches, inspired by the baroque, gothic and rococo traditions of Europe, were built in the Philippine archipelago during the Hispanic colonial era. Many of these churches are well preserved and are still being used as places of worship. Many of these are protected by the national government by inscribing them either as National Cultural Property or National Cultural Treasures. 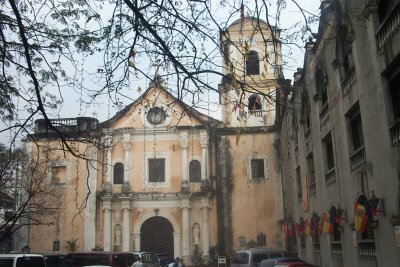 Today, four baroque churches stand out: Church of the Immaculate Conception of San Agustin (San Agustin Church) in Intramuros, Manila; Saint Augustine Church (popularly known as Paoay Church) in Ilocos Norte; Church of Our Lady of the Assumption (popularly known as Santa Maria Church); and Santo Tomas de Villanueva Parish Church (popularly known as Miag-ao Church) in Iloilo. In 1993, these churches were elevated to the status of UNESCO World Heritage Sites (with modification of boundaries in 2013). They are collectively identified as Baroque Churches of the Philippines. According to UNESCO, these churches are peculiar because their unique architectural style is a reinterpretation of European Baroque by Chinese and Philippine craftsmen. I have visited all four churches: San Augustin Church several times, Paoay Church in 2015, Santa Maria Church in 2018, and Miag-ao in 2017. This post contains some briefs about the churches - some reflections about their magnificence. San Agustin Church. According to some sources, the church was patterned by the Augustinians from a church in Nueva España (today Mexico). Built by the Augustinians in 1571 within the district of Intramuros (Walled City of Old Manila), the original structure was made of wood and palm fronds, which later were replaced by adobe stones from the provinces of Bulacan (next province north of Manila) and Rizal (next province south of Manila). Replacing the church with massive stones was strategic. The original wooden structure was gutted in December 1574 on the occasion of the Chinese Pirate Limhawong’s invasion. When the structure was completed in 1604, it became the official convent-house of the Augustinians in the Philippines. A huge monastery was also erected adjacent to the Church. During the Japanese occupation of Manila (Second World War), San Agustin Church became a concentration camp. The Japanese troops held hostage the Augustinian friars and members of the congregation for about three months. Several of these hostages died from the hands of the Japanese. In 1945, Manila was heavily destroyed by both American and Japanese troops. Almost all structures of Intramuros were annihilated save San Augustine Church. For the faithfuls, this was a miracle. 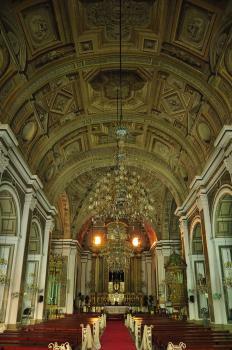 Click here for more details about San Agustin Church. Santa Maria Church. Santa Maria Church is one of the few churches (and convents) which did not conform to a tradition because it is the only colonial church located on a hill surrounded by a defensive wall (almost fortress-like). From the main hi-way (or “national road”) of Santa Maria, the church and the convent may only be reached by climbing a stairway made of granite with 85 steps. From the back of the church, there is a narrow roadway leading to a courtyard. Another wide stairway, similar to the front, leads down from the courtyard to a brick walkway that leads to an old abandoned cemetery. A few yards from the brick fence of the walkway are the ruins of an old chapel and graveyards. 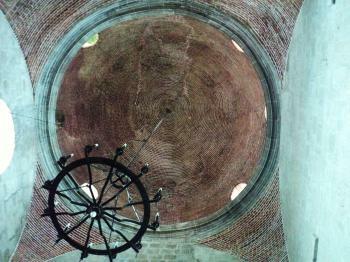 The belfry of the church is freestanding located on its side. Just beside the belfry is a relief image of the Lady of the Assumption, believed to be miraculous by the locals. Some say that at nighttime, the image comes down from the side of the church and becomes an ordinary individual who leads people who seem to be losing track of their destination in the right direction. Click here for more details about Santa Maria Church. Paoay Church. 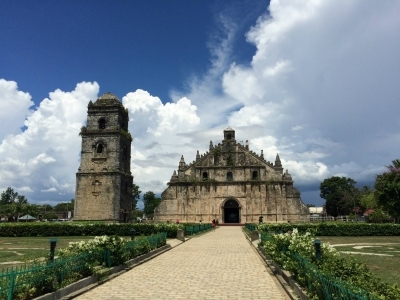 One of the most visited destinations in Ilocos Norte, Paoay Church may be comparable to the Angkor Wat of Cambodia and the Borabadur Temple Complex in Indonesia in terms of massiveness and grandiosity. The 24 enormous buttresses on both sides of the structure, complete the magnificence of the Church. If one poses for a photo on one of the 1.67 metres (5.5 ft) thick buttresses, she may even be mistaken to be standing before a temple complex from Hue in Vietnam or Java in Indonesia or Seam Reap in Cambodia. These buttresses are believed to be the supporting structure of the church from collapsing should earthquake strike anytime in the region. The buttresses are also carved to look like huge art pieces. According to an architect friend from the University of the Philippines Diliman, large coral stones were used to construct the lower part of the wall and red and copper bricks at the upper levels. To strengthen the structure, the laborers used a special mortar that included sand, lime, sugarcane juice, mango leaves, leather, and even rice. According to a friend, these ingredients were also common in Ancient Southeast Asia. This and the resemblance of the structure with other Southeast Asian edifices prove the close link of the Philippines to the rest of the region. Besides, the architectural style of Paoay Church is Javanese. Another interesting feature of this complex is the garden, beautifully landscaped with sporadic spiral accents. In my view, these accents resemble surrealist art because of their depiction of fantasy and dream imagery. They are like motions or movements in a spiral direction. Nonetheless, one local eagerly mentioned that the spirals were inspired by the spirals found at the buttresses and nothing fancy about them. Click here for more details about Paoay Church. Miag-ao Church. My favorite part of the church is its facade, which consists of ornately decorated bas-relief sculptures. The complex of bas-relief sculptures is a mixed influence of Medieval Spanish, Chinese, Muslim and Ilongo. A prominent part of the facade is a coconut tree, which according to my friend is a depiction of the tree of life. There’s also the figure of St. Christopher, which is intentionally dressed in local and traditional clothing. He is carrying the Child Jesus on his back. Other significant images in the facade are the significant everyday materials of the people of Miagao during the time it was being constructed: the flora (like papaya, coconut and palm tree) and fauna. There’s also the image of the town’s patron placed above the main door and just below the image of St. Christopher. In my view, the facade makes it the most celebrated, the most beautiful and the most localized Baroque church in the entire archipelago. Click here for more details about Miag-ao Church. In 2021, the Philippines will celebrate 500 years of Christianity. No one can deny that Christian faith has become a significant part of Filipino heritage. However, as we celebrate 500 years of this colonial legacy, let us also not forget the dark history of Catholicism and Christianity in the Philippines. Let us also remember those who died from the hands of the Catholic Church. Most importantly, let us also commemorate the genius of the locals who in a way, are the unsung heroes of the massive places of worships. These are the artists who sculpted the amazing artworks that make these marvelous architectural wonders truly Filipino. I visited the Church of Church of San Agustin in 2007 and in 2016. The Baroque Churches of the Philippines are a collection of 4 churches scattered throughout the country. By far the most popular and visited church is San Agustin in the Intramuros section of Manila. It is the only church to have survived the bombing by the Japanese in WWII in the Intramuros. In addition to being a functioning church, it is also home to a museum documenting the city, and the church in the Philippines. Read more about the Baroque Churches of the Philippines on my website. I visited just one of the churches listed, San Agustin in Manila. It is the oldest of the churches and I thought represented the site quite well. There are two sections - the church itself and the attached monastery. Both are beautiful and very well maintained. I found the monastery really interesting because there are a lot of exhibits of artefacts and information. Perhaps not surprisingly, the information presented was very biased. If you take it at face value, you would believe that the natives welcomed the colonising Catholics with open arms and converted straight away. Personally, I think it's a pity there isn't a more realistic depiction of what happened centuries ago. In the middle of Manila, the capital city of the Philippines, is the historic district area called Intramuros, protected by old Spanish fortifications and magnificent golf courses, while inside is crammed with post war reconstruction offices, slum and colonial buildings including the famous San Agustin Church, one of the four churches registered as WHS under the name the Baroque Churches of the Philippines. Apart from the very bad state of scaling concrete on the front facade of the church, from outside this church really looks nothing special and unbelievable to be the head-quarter of once powerful Augustinian order. However after I opened the grand carved wooden door, I was really surprised with the very amazing interior of the church. The church is highly decorated with baroque elements; the altar and the pulpit are just lovely with pastel green colors and gilded details. However the real star of the church is the magnificent ceiling with unbelievably beautiful trompe l'oeil, I looked at this great piece of art with surprised and hard to believe that I was in Asia while so many European arts around. The other interesting is that the church side aisles have been divided into many small chapels by the very thick wall that acted like buttress to support the church from earthquake. Another interesting from this church is that it is a very popular place for wedding; the central aisle is always decorated for wedding ceremony with many beautiful flower and white satin. I decided to join the holy mass to see the church during its best moment, all chandeliers were lid and the grey ceiling was transformed to be bright yellow! The chant by priests echoing the place was just indescribable, and hundreds of Filipino were sitting, standing or even jumping to see the ceremony! And not surprised that outside the church, couples and their curious relatives were waiting for their turn on wedding rites after mass. Since I only saw San Agustin Church, I prefer not to make any conclusion on this WHS, also the earthquake baroque element which made these churches famous is not quite easily obvious from my visit. However, from my observation, San Agustin church is in awkward state and need better preservation, the scaling concrete and paint is obvious evidence and some of the stained glasses at rose window are missing. The severe pollution of Manila already deteriorates the craving details of beautiful wooden doors as well as other details of building exterior. It would be tragic if this old church that survived many earthquakes and the sole survivor from the Battle of Manila succumb by lack of good preservation despite UNESCO registration. I am fortunate enough to be residing just 3 houses behind Paoay church -considered as the best example of earthquake baroque architecture. I have seen the four churches and each has its own unique characteristics. One of the better sides of visiting churches is that they have no entrance fees at all! San Agustin Church of Intramuros (Spanish: Ciudad Murada) is the oldest standing stone church in the Philippines. Unlike Paoay and Sta. Maria, San Agustin does not have external buttresses. The earthquake-proof system are its internal buttresses (that forms the side chapels inside) and vaults. The trompe l'oeil ceiling paintings were made by two Italian painters in 1875. Several conquistadores are also interred within the church. If given the opportunity to go inside the monastery and alleys, grab it - it is the church's best kept secrets. Notice as well the presence of Chinese fu dog statues on its facade. These were donated by the Chinese merchants who were in peaceful coexistence with the meztizos and Spaniards residing within the walled city. The church is largely made of volcanic tuff. Maig-ao Church is a squatty church (similar to most Latin American churches) in the Visayan region. 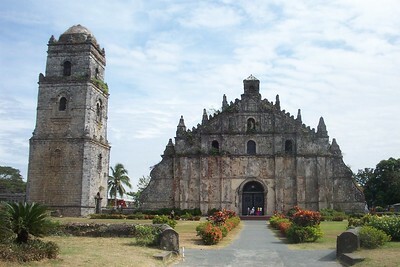 Due to the threats of Moro pirates in the Visayas, the church was made following the tradition of "fortress baroque" architecture. Miag-ao Church, together with Paoay and Sta. Maria does not boast a magnificently decorated interior. It prides, however, its facade - a real masterpiece of Filipino creativity. Notice how the towers are of unequal heights. The church is made using limestones and coralstones. While in Manila for a brief time, my short excursion into Intramuros was enjoyable. Like others have mentioned Manila is a chaotic city (both good and bad!) and San Agustin Church is an enjoyable moment of solitude. For anyone visiting Manila, there are two churches worth visiting, San Agustin and San Sebastian Church. If and when I make it back to the Philippines I would love to visit some of the more remote churches included in this serial site. While the complex seems almost interchangeable with some churches in Latin America, if you look closely you will notice the small lion statues (guarding) the entrance of the church. Santissima Trinidad Parish In 1795 the Loay was separated from Loboc to which it belonged as a visita. Other authorities give 1815 as the foundation date. The church complex is built on a plateau facing the sea and near the mouth of the Loboc River. A flight of stairs connects the church complex to the rest of the town located below the hill. The vehicular entrance to the complex is via the road to Loboc. Just been to the Ilocos region to see Paoay and the Sta. Maria churches. I have visited San Agustin church in Intramuros likewise. Seeing these churches felt like I was thrown back in time. 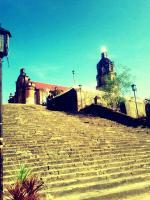 The Paoay church surely made an impression on me. Perhaps it's because one can see the whole structure without any distractions around it and also it is very imposing, really. I loved it. What I like in the San Agustin church in Intramuros is its grandiosity, that trompe l'oeil ceiling. The Sta. Maria church impressed me with its location the most though. I think something should be done for Paoay church. Its kind of falling into neglect. I visit Manila regularly and check out its beautiful churches all the time. The church of San Augustin always astound me, even if I visit it a lot of times. However, it usually is closed, but can be accessed via the monastery, which also doubles as a museum. For a sum of 100 pesos, I can visit the museum and also I am granted access to the choirloft. This gives a breathtaking view of the church. A must see! I really like the trampe'oleil paintings and the lectern on the choirloft. The exterior is very simple, actually not that impressive on my opinion but do check out the carved wooden doors on the portals and also the chinese guard dogs- a perfect example of east meets west influence. Another notable church is the San Sebastian. It is a complete stand out, being built in Neo Gothic Style, not common in most churches in the Philippines. Also it is made entirely of steel! A rare gem. And the good part is, it is always open! Even if the portal doors are closed, just go to the small door on the right side of the church, walk past the small, office like room and to a sort of courtyard where the side portal of the church is kept open. It is usually empty. Perfect for quiet medittation and prayer. 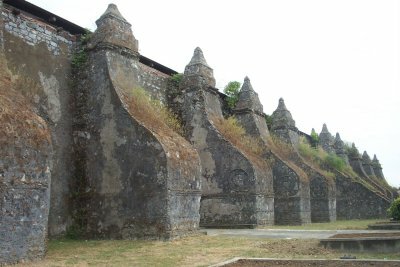 Visited Paoay and Santa Maria last March (2009). Santa Maria Church is situated on a hill - giving the impression that it was used both as a place of worship and a fortress. I visited the San Agustine one in Manila. The timing was bad because I couldnt see inside. But from the outside, I couldnt see very much of it's "greatness" to be submited as of the WHS. I have just been to Miag-ao last Saturday (i was touring around Visayas even with typhoon Caloy doing its own tour all over the country :D) and i think it was resplendently beautiful. I have seen Paoay and Baclayon also but I think Miag-ao is incomparable. and i'm glad i've visited this site and have come to know more about the history of Miag-ao. You should also give details of the Miag-ao church in Iloilo not just becuase of its beauty but also because of its historical value. it is dubbed as the "most filipino of all churches" because in the facade you can see bas relief details of Philippine fauna and flora with St. Christopher at the center. Aside from being a church it served as a fortress where native Visayan Christians took refuge during muslim raids (as evidenced by very thick walls--captured natives were sold as slaves in Mindanao). The belfies are asymmetrical because they were built at different periods, one being toppled down by an earthquake and was replaced. The entire church has a beautiful glowing yellowish color because of the sandstone stucco. In addition to the earlier info I posted about San pedro Macati Church (Sts. Peter and Paul), the representatives Archdiocese of Manila discovered that 2 of the 3 Bells in that Church is the Oldest and 3rd oldest Bell in the whole Archdiocese of Manila. Tha main Altar of this church is wonderfuly hand crafted and very detailed. I didnt know San Pedro de Makati church had such an interesting background, unfortunately, it takes more these features to be included in the WHS list and Im sure those who nominate and approve these sites have their own criteria in doing so. If you ask me to nominate another church in the Philippines, it would the the San Sebastian -Asia's first and only all-steel church. 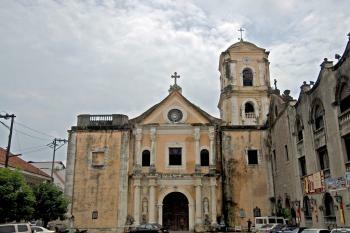 There is another Baroque church located in the heart of Makati City. It is now called Sts. Peter and Paul Parish. 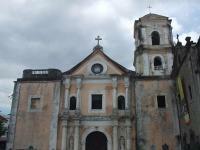 It was originally known as San Pedro Macati Church and was built by the Jesuits as Noviciate in 1620. The Church remains standing there. It should be included in the list of Baroques Churches of the Philippines. It is full of historical past including being the camp/hospital during Filipino-American War.It is the only church in the Philippines who has a Papal Tierra in its facade. It is still the original Tierra carved in wood that can be seen there. It is also here in this church that a very unique image of Virgin Mary called "Nuestra Senora dela Rosa" can be seen. This image is said to have a strand of hair of Virgin Mary placed in its chest. It was brought to this church from Acapulco around 1720 if I'm not mistaken. It was recognized during that time as one of the most beautiful image of Mary according to an Artist named Atlas. In the main altar along with Nuestra Senora dela Rosa is a very old Image of Sto. Nino de Passion which is also unique and one of a kind. I hope that the World heritage Site commission will look into this matter. I just visited Miag-ao Church and it is indeed very beautiful. We went to Iloilo for the Dinagyang Festival which is held on the last weekend of January. We went to Miag-ao and loved the rod trip going there. You should not miss having lunch at Allan's (Oton) or in Doming's (Miag-ao) for their oysters and other seafood (and they're very cheap too). The Miag-ao Church was extraordinarily beautiful - with the buttresses and the intricate design of the front facade of the Church. Too bad we weren't able to enter the Church because it was closed (I don't know if it was closed because it was a Monday or if it was because we were there during lunch time). The very first WHS I visited. San Agustin in Manila (one of the 4 listed) was where we once had a school trip. It wasnt one of the things I noticed then but I was enthralled at the ornateness (and musty smell)of this 400 year old place that is so redolent of our country's Hispanic past. I remember not being able to sleep that night because I remembered seeing a room full of tombs! Something really to remember by. Ive been back countless times eversince and have even drove 8 hours just to see the 2 other World Heritage Churches- Santa Maria and Paoay in the Ilocos provinces and feeling as giddy as an eight-year old getting his first lollipop! Prison: Wiki "During the Japanese occupation of the Philippines during World War II, the Church of San Agustin became a concentration camp for prisoners. Japanese soldiers held hundreds of Intramuros residents and clergy hostage in the church during the final days of the Battle of Manila; many of the hostages died during the three-week long battle"
Freestanding Bell Tower: two of the baroque churches in the Philippines have free standing bellfries -- Paoay Church and Sta. Maria Church. This is one of the characteristics of the "earthquake baroque"
Gates depicting Lions: the gates of San Agustin Church in Intramuros are adorned with Chinese Lion Dogs (Also called as Fu Dogs) that were given by the Chinese people coexisting with the christians that time. Tombs: San Agustin church in Manila houses the sepulchre of the conquistador Miguel Lopez De legazpi, among others. Damaged in World War II: Wiki "The Church of San Agustin ....survived the bombardment of Intramuros by American and Filipino forces with only its roof destroyed, the only one of the seven churches in the walled city to remain standing. The adjacent monastery suffered total destruction. Architect Angel Nakpil designed the rebuilding of the structure as a museum in the 1970s." 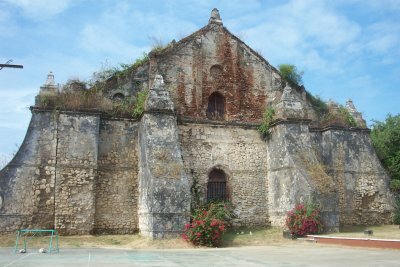 Piracy: The Miag-ao Church, one of the Baroque Churches of the Philippines, became a "fortified church" to counter the attacks and pillaging by pirates.